I hadn’t read any books by Louise Bagshaw before but having read quite a few positive reviews about some of her books I was keen to give her a try. As a consequence, I have just read ‘Tall Poppies’ which was one of her earlier books as it was first published in 1997. On reflection, it might have been better for me to try one of her later books as, quite possibly, like wine she might have matured with age. That is not saying that I didn’t enjoy ‘Tall Poppies’ but it did not hook me in and keep my attention like many books do. This book tells the story of two women – Nina Roth and Lady Elizabeth Savage – who are both trying to succeed in the chemical business despite many setbacks. Nina grew up in a poor area of Brooklyn and had to fight for everything she ever had. In contrast, Elizabeth appeared to have everything – that is everything apart from a father who loved her and wanted her to succeed. Tony Savage, who heads Dragon Chemicals, only wanted Elizabeth to find a good suitor and get married! Tony does humour Elizabeth though and allows her to come and do some work at Dragon whilst also pursuing a successful downhill skiing career. However when this is tragically cut short she discovers that Tony never had any real intention of giving her a proper role in the company. Nina also ends up working for Dragon most successfully – that is until she decides that she no longer wants to play Tony’s games. Even though the two women are so very different and actually despise each other, they realise that if they are going to exact revenge they will have to join forces which is indeed what they do. As the book moves towards its climax, you find out whether they are able to succeed in doing so! This book isn’t bad by any means but neither is it a really great read. The premise for the story is quite reasonable yet somehow it just failed to grab my interest. I was reading the book thinking that it was a sort of OK read but it certainly did not have that can’t put down feeling unfortunately. 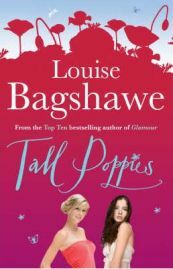 As I said though, Tall Poppies was one of Louise Bagshaw’s first novels, and I wouldn’t want to judge her just on this one as it did show potential. I think that one of the biggest problems with this book is the fact that it is very hard to like either of the two main characters and I always maintain that if you don’t like them, you don’t really care what happens to them which is exactly how I felt. This was a shame as I felt that there was potential for them to be much more appealing especially as they faced up to Elizabeth’s father. Although this was not my favourite novel of all time, it has not put me off reading other books by Louise Bagshaw. In fact I would be quite interested to read some of her later ones and would happily receive any recommendations. Tall Poppies was after all easy to read and had a good storyline although there were times when it seemed to jump a bit. I think better and more sympathetic characters would have made it so much better though. No Comments on "Tall Poppies"